Present state: Demolished - although the track has been lifted the ballast still remains. Notes: Sutton Oak was situated on the Widnes and St Helens line which had originally opened on 21 February 1833 as the St Helens & Runcorn Gap Railway (SH&RGR). Built primarily for the movement of coal from the St Helens coalfield to a dock on the river Mersey (Widnes Dock) at the Runcorn Gap the line did carry passengers from its first year of operation, but there were no intermediate stations between the dock and St Helens. On 21 July 1845 the SH&RGR became the St Helens Canal & Railway Company (SHC&RC) when it merged with its competitor the Sankey Canal Company. In the years following the original line was improved through doubling and the eradication of two inclined planes, and the overall network of the SHC&RC expanded. From the early 1850s intermediate stations were provided along the line and passenger services improved. Sutton Oak station first appeared in the public timetable in 1852. It was located to the north of Lancots Lane which passed under the railway. The main facilities were on the up platform (St Helens direction) accessed from a driveway and a path that linked to Lancots Lane. A single storey brick building was located on the up platform that housed a booking office two waiting rooms and toilet facilities. The down platform (Widnes direction) probably had only a basic waiting shelter at first but by the 1890s it had gained a single storey timber building that housed a small booking office and a waiting room. The down platform was connected to street level by steps and a barrow crossing was provided at the south end of the station. Less than half a mile to the south-east of the station was Sutton Oak Junction which was the point at which a line from Blackbrook converged with the main line and a spur to the Liverpool and Manchester Railway diverged connecting with it at St Helens Junction (the route between St Helens and St Helens Junction had opened on 2 January 1832 and had been used by horse drawn passenger trains from September 1832). 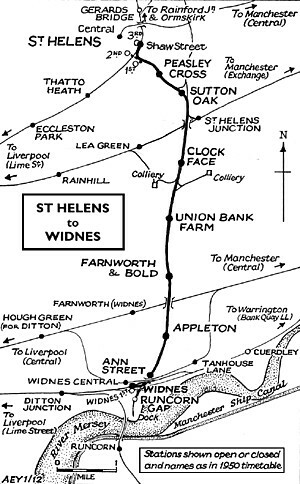 At the time of opening Sutton Oak station would have been served by trains running between St Helens and Garston and between St Helens and Warrington via Runcorn Gap (Widnes). There were twelve trains per day in each direction which ran mostly at hourly intervals. Trains left St Helens at half past the hour and Runcorn Gap at five minutes to the hour. Alternate trains at two-hourly intervals ran to Garston or to Warrington. On Sundays there were four trains each way between St Helens and Runcorn Gap with four onward connections to Garston and three to Warrington. Sutton Oak was also served by trains running between St Helens and St Helens Junction on the Liverpool and Manchester line. This service was known locally as the ‘junction bus’. On 31 July 1864 the SHC&RC was taken over by the London & North Western Railway (LNWR). By 1879 a signal box had been opened at Sutton Oak station. It was located on the down platform towards the south-eastern end. In 1880 the Sutton Oak Locomotive Shed was opened half a mile to the north-west of the station. There had been a great deal of expansion of railways in the St Helens area and a large shed was needed. The passenger services that served Sutton oak station were hauled by locomotives based at the shed. By December 1895 Sutton Oak had twenty-nine up and thirty-two down trains Monday-to-Friday as shown in the table below. There was an extra working in each direction on Saturday and eight each way on Sundays (five each way being between St Helens and St Helens Junction). The majority of the services were those running between St Helens and St Helens Junction. 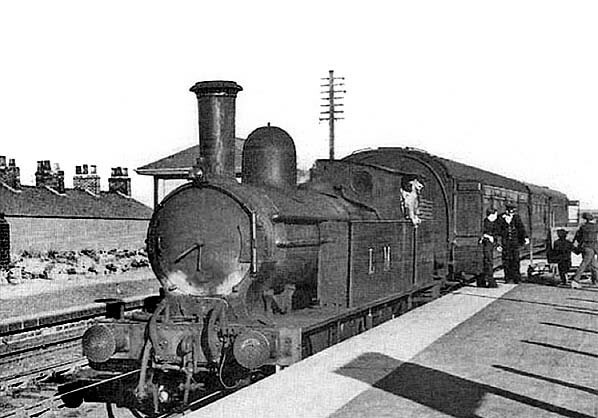 On 1 November 1911 the LNWR introduced a rail-motor onto the Ditton – St Helens service. It was given the nickname of the ‘Ditton Dodger’. The service proved to be very popular, and the rail-motor became inadequate. It was replaced with LNWR Webb coal tank locomotives and coaches fitted to operate in push-and-pull mode. The name Ditton Dodger for the service stuck and continued to be used by local people, passengers and railwaymen. After the Great War a passenger service began to run from St Helens to Clock Face Colliery and to Sutton Manor Colliery. Clock Face Colliery, located to the east of Clock Face, had started production in 1908 and Sutton Manor, located to the south-west, in 1916. The service called at all stations between St Helens and the collieries, including Sutton Oak. A train for day shift workers left Sutton Oak for the collieries at 5.54am Mondays to Fridays and at 5.04am on Saturdays. The night shift train departed Sutton Oak at 10.04pm. The day shift men arrived back at Sutton Oak at 3.11pm Mondays to Thursdays, 3.31pm on Fridays and at 12.43pm on Saturdays. The night shift trains arrived back at 7.06am Mondays to Fridays and at 6.11am on Saturdays. In July 1922 there were thirty-three up services and thirty down Monday-to-Saturday. Twenty-three of the up and twenty-one of the down trains came from or ran the Liverpool and Manchester line. On Sundays there was only one train in each direction between St Helens and St Helens Junction. At the railway Grouping on 1 January 1923 the LNWR was absorbed into the London Midland & Scottish Railway (LMS). Sutton Oak station signal box was abolished in 1931 and demolished. In the early 1930s Sutton Oak had an intensive passenger service. The LMS Summer timetable for 1932 showed Sutton Oak as having forty services in each direction Monday-to-Friday with extra trains on Saturdays. The station was closed on Sundays even though passenger services did run between St Helens and St Helens Junction. The colliery services had ended by this time. The start of the Second World War on 3 September 1939 saw the passenger services reduced the Ditton Dodger service to only three trains in each direction in the morning and three in the evening with none between 8.30am and 4.15pm. The line had always been a busier route for goods services, and it was busier than ever during the war years. After the war the service was not restored to its previous levels. On 1 January 1948 Clock Face became part of British Railways London Midland Region. The summer timetable for 1948 showed only seventeen up and fifteen down trains Monday-to-Friday. There were retimed workings on Saturdays and a couple of extra trains. On 1 March 1949 British Railways renamed St Helens station as St Helens Shaw Street. In 1951 British Railways proposed the withdrawal of the Ditton Dodger service and complete closure of Sutton Oak. Despite local opposition the service was withdrawn on 18 June 1951 the last trains running on Saturday 16 June 1951. Although Sutton Oak had services running between St Helens Shaw Street and St Helens Junction it was closed as a passenger station on the same day as the Ditton service ceased. Passenger services continued to pass through the station running between St Helens Shaw Street and St Helens Junction (with some continuing beyond that point to Earlestown or Warrington Bank Quay). In the early 1960s there were thirty-three trains in each direction but the service was listed in the 'Reshaping of British Railways Report' of 1963 (The Beeching report) for withdrawal and it ended on 14 June 1965. Sutton Oak Locomotive Shed closed on 19 June 1967. The line was always more important for freight and it remained so right through to the 1970s. Decline started from 14 December 1969 when the section between Sutton Oak Junction and Farnworth & Bold was singled. 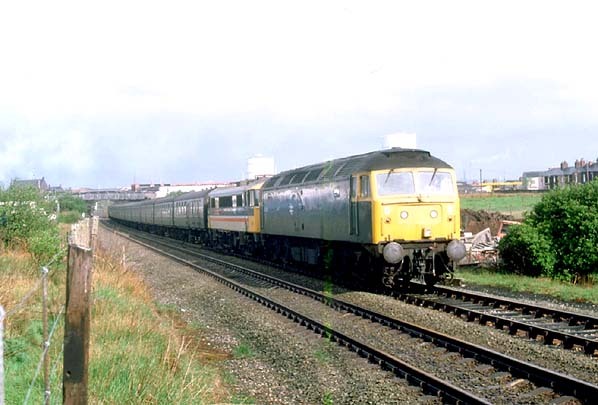 On 1 November 1981 it closed as a through route between Clock Face and Widnes, the last service to run from Widnes being on 31 October 1981 when a class 40 (40 124) ran north towards St Helens and onwards to Wigan. Following the 1984-5 miners’ strike, Sutton Manor Colliery closed, the section of line between Sutton Oak Junction and Clock Face saw its last train on 15 August 1987 and was taken out of use on 10 October 1987. 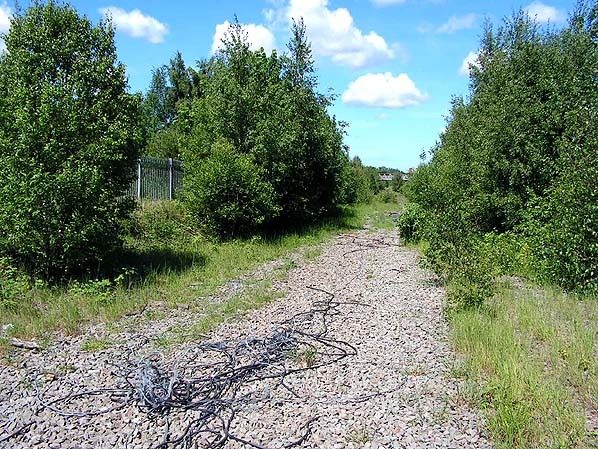 This left only the route between St Helens Shaw Street and St Helens Junction which remained a double track railway. It closed on 27 May 1989 and had been lifted by the end of the year (except for a section between St Helens Shaw Street and Hayes Chemicals). 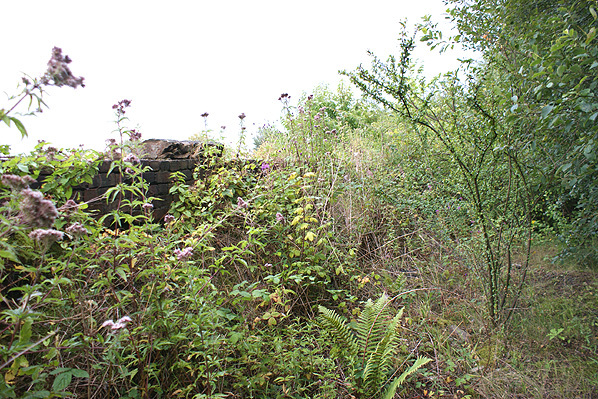 In 2011 the trackbed was still in situ at the Sutton Oak station site and some remains of the station, such as walls, could still be seen. A Ditton Junction to St Helens Shaw Street service is seen at Sutton Oak station on 26 April 1951. A couple of passengers have got off the train and can be seen walking towards the up platform exit while railway staff prepare to load parcels. At the head of the motor train is an ex LNWR Webb tank number 6628. The locomotive is still wearing its LMS livery. It entered service in December 1891 and was withdrawn from Sutton Oak shed in July 1951 after the Ditton Junction and St Helens Shaw Street service had been axed. Sutton Oak station shown on a 1892 town plan. Sutton Oak station is shown as a disused station on this late 1950s map. 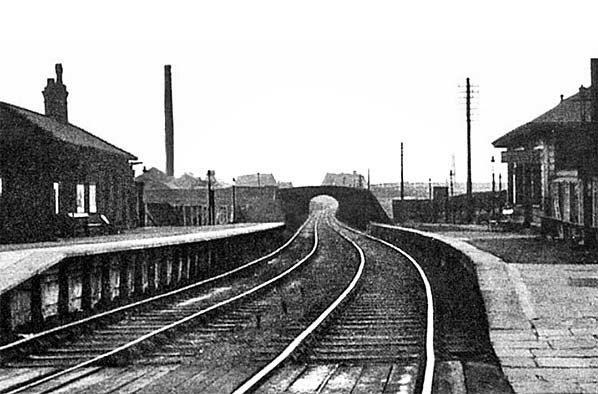 Sutton Oak station looking north in 1951. The station enjoyed only a sparse service at this time which would account for it being deviod of people. 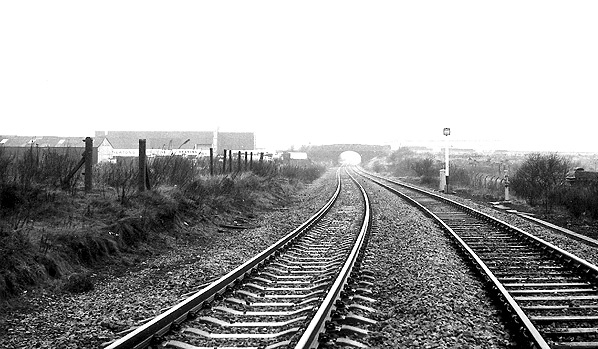 Looking north at the site of Sutton Oak station on 2 January 1982. A St Helens Shaw Street to Wembley Central rugby league special is seen passing through the site of Sutton Oak station in May 1987. At the head of the train is a class 47 diesel locomotive and behind it a class 86 electric. The electric was dragged as far as Warrington Bank Quay where the diesel would have been taken off the train. The electric would then have hauled it to Wembley. Looking north at the site of Sutton Oak station in May 2005. The line through the station had closed in 1989 and was lifted shortly after. 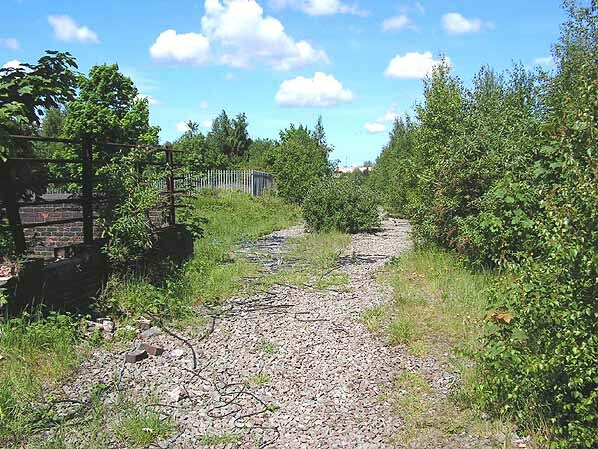 The Sutton Oak station site looking north in May 2005. 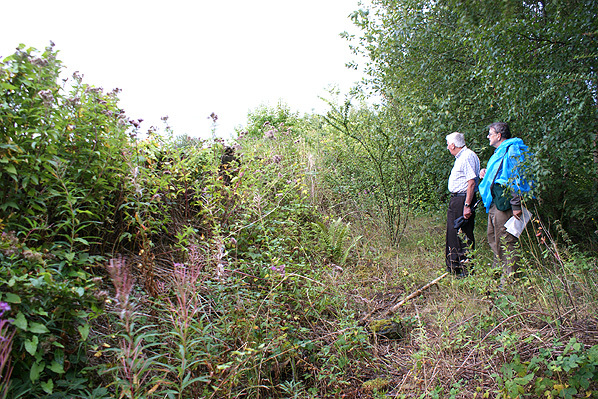 8D Association members Colin Turton anf Tony Graham look at the platforms degraded remains. As a passed cleaner at Widnes Locomotive Shed (8D) Colin Turton passed through Sutton Oak station many times fireing goods trains. A section of wall from the rear of the Sutton Oak down platform seen on 18 August 2011.